I'll make some biscuits, and I'm going to try making the cake balls cos they sound and look fab, but I won't be able to distribute, as I won't have any hands free - I'm now walking with a stick and a crutch, so can't work out how to juggle biscuits as well! The first year, I tried a giant plastic box affixed to my back with strapping and industrial velcro. That worked extremely well from the perspective of having free hands to actually hand out cookies and accept donations, but it was a bit... overt. The second year, I went covert by cosplaying as a TF2 Engineer and using my Engineer's toolbox to distribute cookies. This was less overt, but was more inconvenient from a distribution perspective: I found that, to be useful, I generally had to find a table to actually situate myself well enough to give cookies and get donations: which was too limiting. The ideal situation in both cases was probably when JonXP and DJBreslin tag-teamed with me. DJ passed out buttons, JonXP took donations, and I handed out cookies... this was highly effective, but of course uses three people as resources. This year I'm going to try finding a balance between covert and free hands, but it's going to take some thought. For distribution, it depends... I've seen some people put 2 small cookies in a single package and one large cookie in a single package. Up to now, the majority of our baked goods have come to us in one giant bag that we basically just open up and let people grab cookies from, but admittedly that's less sanitary than having them individually wrapped or wrapped in groups of 2: so if you're willing to wrap them, that'd be awesome! For the cake balls, I can picture giving them one at a time: it looks like they take a lot of time to make, and they are extra special in deliciousness: packaging them individually will probably be good because of that... but that's just my take on it. I've made some cake balls as a trial, my family loved them, so I guess I'll be making a batch for PAX. I second the thought for chewy snickerdoodles. I haven't had a homemade one of those in years. They are cookie copulation in my mouth and yes I like to alliterate. Ohhh... I like baking! I like cookies! I'd definitely like to make something. I'm also not really going with anyone ... so distributing might be a good idea to force me to say hello to some people. Sign me up as well! Regardless of the fact that I am already doing something at the event, I want to give out cookies. I will probably bake some as well since I LOVE to bake. Hmm. I may throw a bake party beforehand. heh. Advice: Be very precise with your measurements and have a strong arm. Aside from choco chip cookies, sugar cookies and snickerdoodies, any other suggestions of well liked/popular cookies? Should we all kind of make our own weird batches or should we leave certain types to certain people to make huge amounts? This. Is awesome. I was actually thinking of doing something just like this anyway (baking cookies and giving them to people for no toher reason than to give cookies to people), so it's great to see not only other like-minded people, but a kind of central organization about it! I will see all you other awesomes there! Last year the peanut butter cup and butterscotch chocolate rice krispy treats were really popular too -- although, the chocolate chip were the first ones to run out for me. I am so in! I am a caterer with an exceptional love of baking. I am tempted to try out something a little more elaborate, like mini-Portal Cakes in cupcake form or Health Pack cookies to go with my L4D costume. Would that be okay? Also, is just writing here a sign-up? Do we have to meet up at PAX to check in/sign something? Writing here is definitely a signup if you're interested: we're going to have meetings at PAX itself to make sure that the Child's Play money is centralized, and to make sure that distributors are restocked on cookies. The details of this, however, we've not figured out quite yet... but at PAX Prime we tended to meet in the morning and then we had someone who had a "stash" of cookies that bakers could add to and distributors could pull from.  We're still working on how we're going to make that part happen at PAX East. Did you see the What should I bring? thread? People there advised not selling or giving away outside food while inside the convention center... Something about competition with the center's own food vendor(s). So very very excited! Couldn't bring cookies to PAX 2009 cause we were flying and it was our honeymoon. We're driving down to Pax East so as long as boarder patrol doesn't eat all the cookies I bake, or the van full of hungry gamer men for that matter then i'll be there with baked good for all! Including my famous blueberry flavored voidwalker cookies for the WoW geeks in our midst. My wife and I have talked about it and, in a worst case scenario (if we aren't allowed to distribute cookies IN the convention center for Child's Play donations), she'll be willing to just distribute the cookies outside the convention center. Not quite as convenient, but at least the cookies still get out and some money still gets raised. I'll be sure to bring a black t-shirt. I could maybe throw in a few doz. white chocolate macadamia, do they have to be individualy sammich bagied or anything? YAY for Cookies! YAY for Charity! YAY for Cavities!!! [SIGPIC][/SIGPIC]I would love to change the world, but they won't give me the source code. I have heard legends of this whole cookie thing from PAXs past but I still don't understand it. Can someone really explain what is happening? I get that there are people baking cookies, people handing out cookies, and people keeping cookies? There are secret cookie people walking around with cookies? But you need to hunt them down and find them based on badges? With 30,000 people at the convention how long do the cookies last? Are the gone before the convention is even started? I read the stuff on the Cookie Brigade webpage but still dont get it. Should I expect to see lots of Dickerdoodles? I have to put in my cookie two cents... I chewy snickerdoodles, but I also really like white chocolate macadamia nut cookies. As far as how it works, Lord Jezo, the basic gist of it is that there's people who bake cookies and people who distribute in exchange for donations to Child's Play. The bakers provide the cookies for the distributors, and the distributors go out, ninja-style, into the crowds at PAX and give out the cookies to whoever wants them. The level of "ninja-ness" required depends a lot on the disposition of the convention center and its employees, how crowded the area is, etc... in the past we've used buttons, roll-up banners, and cosplay to disguise our true cookie brigadeering cause. As far as how long it lasts, that depends entirely on how many bakers and distributors we get, and whether we can successfully make sure that the former can get in contact with the latter for the purposes of distribution. Whether THAT is successful depends on if we have someone willing to step forward and help with the management of this cause... as I believe all of our usual leaders are going to be absent for PAX East. gah.. my management skills are null. I'm also way to shy to bootleg baked goods. I was kinda just hoping to donate my Mad PHAT Macadamiaz. need a good recipe for the good cause? click the spoiler. ***a pinch each of ginger and saffron *** you can omit these but they really do make the diff. 1. This recipe makes a large batch of 48 full size cookies. The full batch will fit in a 5 quart mixer. Divide the recipe in half if needed. 2. Make sure the oven keeps the right temperature. The cookies may need a minute or two more or less than stated. but DO NOT OVERBAKE. 3. Preheat oven to 350 degrees F.
4. Line baking sheets with parchment paper (no need to grease). 5. Measure flour, baking soda and salt in a large bowl and blend together. Set aside. 6. In a large mixing bowl, preferably a heavy-duty mixer, and using the paddle or beater attachment, beat butter until creamy. 7. Add brown sugar and beat again. Scrape down the bowl and add the granulated sugar. Beat until fluffy. 8. Add eggs one at a time, beating after each addition. 9. Add vanilla, beat and scrape again. 10. On low speed, add flour mixture 2 cups at a time, and mix well. 11. Mix in white chocolate and macadamia nuts. Mix only until blended. 12. Using a cookie scoop, place dough on prepared baking sheets, spacing evenly to allow for spreading. 13. Bake at 350 degrees for 10-12 minutes or until lightly browned. AGAIN Do NOT over bake these cookies. They continue to bake for a few minutes after they are removed from the oven. 14. Transfer to cooling racks. Store in air tight container or plastic bag to stay soft and moist. 15. Makes 48 warm and gooey cookies. Aye, I don't doubt that there were some occasional slip-ups... my two things I usually say are either "Cookies for Child's Play!" (if I don't have time to give a longer statement, which I hope implies optional donations) or the much longer and more explained "I'm with the Cookie brigade. Take a cookie! We also accept donations to child's play if you have the funds to spare!" or some variant of that. Inevitably several dozen times each day I have to explain what Child's Play is, which is good because more people know: though I'm not sure how they were on the site long enough to find out about PAX without knowing about Child's Play. =) Maybe they came to the PA site at the wrong time of the year? 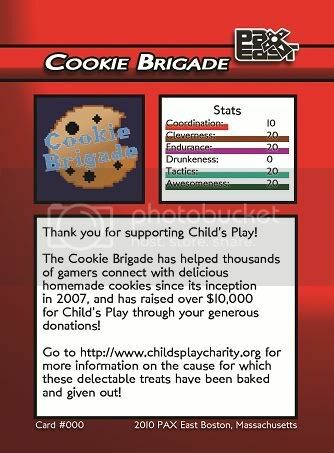 I have never been to PAX before, so bear that in mind - I assume the cookies are packaged in some way, so couldn't we put a sticker on the packaging saying "donations go to Child's Play"? How much of a minimum donation is expected per cookie bag? My wife and I will be on Cookie Brigade duty pretty much until out supplies run out. We're almost always together, and I'm easy to pick out. I'll be the guy in the red wheelchair with the tall back. My wife will be the awesome geek chick next to me. Maybe we (the Cookie Brigade in general) should wear some sort of button or ribbon to identify us? I'm open to suggestion. Lord Zero: It's my understanding that there is no minimum donation. It's whatever people can give. If they're truly strapped for cash, they just get a free cookie. If they've got a bit to spare, then some money goes to a good cause. Oh, and VThornheart, let me know if there's anything we can do to help, other than what we're already doing. I definitely think identification could be good, as long as it's subtle and hideable should the need arise. In prior years, we've used big cookie brigade buttons to identify ourselves... but with buttons not being done at PAX East, they're a bit less easy to disguise. 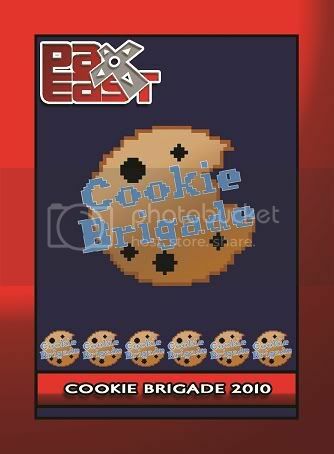 With the buttoneering being done at PAX Prime, our Cookie Brigade buttons could "hide in plain sight" as it were. Okay... I've not heard back from Hypatia yet, hopefully she'll get back to me soon. Until I hear from her, I'm going to try my best and help out with some pre-organizing. I'm going to send PMs right now to people who have already expressed interest in helping so that we can organize: please respond to the PM via the E-Mail address I'll be sending you so that we can get ourselves organized! If you want to volunteer, post here and I'll PM you as well! Also, dragonkitty, it's definitely not too late! I'm about to start PMing people, respond to the E-Mail address included in the PM I'll be sending so you can get on the list! Our biggest management problem is making sure that people who have cookies but don't want to distribute can find a way to pass their cookies to people who want to distribute but have run out of cookies, so hopefully this list will help. I had signed up through the website, but not sure if that's being monitored, so you can count me in as a distributor. Also, I could probably make some stickers - any idea how many cookies we'll have for this? Ah, aye, that was one of the problems... I just got an E-Mail from the lady who set up the website, she said she could forward me all that info for the purpose. What do you guys think of this card? Any revisions you'd want to see in there?